Today and Wednesday we'll meet our authors of the HISTORIC COVER CLASH. The polls are still open! Vote, comment, and discuss, here and on our Facebook page. 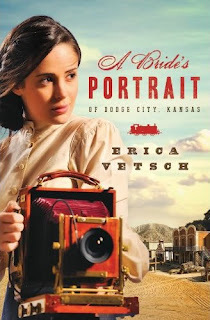 Erica Vetsch is a transplanted Kansan now residing in Minnesota. She loves history and reading, and is blessed to be able to combine the two by writing historical fiction set in the American West. Whenever she’s not following flights of fancy in her fictional world, she’s the company bookkeeper for the family lumber business, mother of two terrific teens, wife to a man who is her total opposite and soul-mate, and avid museum patron. It's so difficult to pick out a favorite part, since I love some of every part of the process, from original idea to holding the finished product in my hand. Though writing is a mostly solitary pursuit, I've met some amazing people through writing fiction. I spend the bulk of my writing time actually writing the first draft. Editing is accomplished more quickly for me than the initial writing. I have always loved history, studied to be a history teacher, and haven't yet found a historical museum that didn't have something in it that fascinated me. Historical fiction was a natural fit. The initial idea for this book came from perusing a book about cowboys and seeing a photograph of a cowboy and his horse in full regalia inside a photographer's studio. My mind kicked into high gear about who would take such a picture. Barbour allowed me quite a bit of input on the cover, which pleased and surprised me. They sent a picture of the cover model, whom I loved, as well as photographs of several possible costumes from which I could choose. Then they sent pictures of cameras, asking which would fit the era the best. In addition, I filled out a lengthy cover art sheet answering questions about the characters, setting, and story line. I can't think of anything I would change about the process. The design team at Barbour is fabulous to work with. Probably genre first. If I'm looking for something new, I often go first to the mystery section. I browse the titles, and when I land on one that intrigues, I pull it out to look at the cover art, read the back cover and author bio, (check to see if it is part of a series, because I hate jumping into the middle of a series) and check out the first page of the book. If all those things click, I'll most likely buy the book. Erica's question for you: What has priority when you buy a book? The author, the genre, the story idea, the cover art? Or is it something else? Lacy Williams recently welcomed child #2 into her family—a baby boy. With a toddler girl, a husband, and three dogs underfoot, writing takes up what’s left of her free time. Lacy is a member of the American Christian Fiction Writers and Romance Writers of America (RWA). 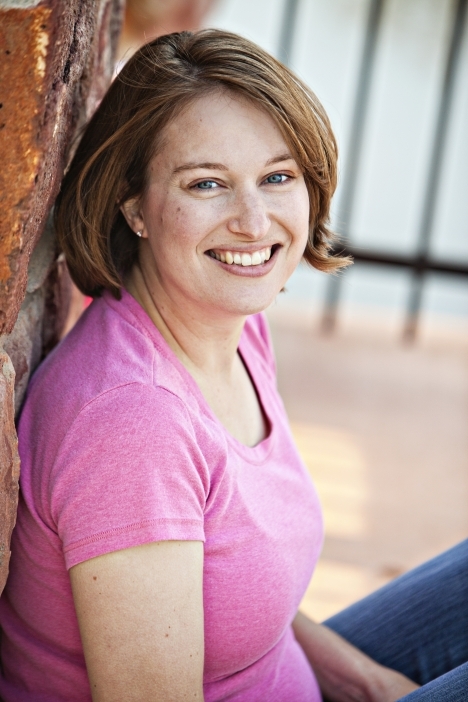 She also teaches fiction writing classes part-time for a local technical school and speaks at local writers’ groups. Lacy’s debut novel (featured here!) is a 2011 RT Reviewers’ Choice finalist. 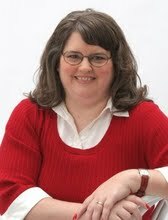 Lacy will release two books in 2012, THE HOMESTEADER’S SWEETHEART (May) and COUNTERFEIT COWBOY (December). Writing the actual manuscript definitely takes me the longest. I also spend quite a bit of time before I start writing doing research and getting to know my characters. My books are character-driven , so I really have to know who they are before I can start writing (or else I write a lot of nonsense in the beginning!). My favorite part of the experience is seeing the cover art for the first time. I have loved the covers of my first two books and I am always waiting to see what the next one will look like. Will it be what I imagined and did they get the hero’s looks right and oh yeah, my name is on there! I also really enjoy making bookmarks and incorporating the cover art into my webpage. I started out thinking I would be a contemporary writer, but I love to read historical. As I worked through my writing journey, I figured out that my voice is a good fit for historical and that romance is definitely my genre because I love happy endings. The initial idea for MARRYING MISS MARSHAL came from a trip my husband and I took to Grand Lake (in northeastern Oklahoma). We were driving along and I got inspired and started thinking about a woman sheriff in this small town and what would her obstacles be? The story started out as a romantic suspense (contemporary) but that was about when I started figuring things out with my genre and lo and behold—the story morphed into a historical woman town marshal. I just finished inputting cover art info for my December 2012 book, so this is fresh in my mind. :) At Love Inspired, they ask a ton of questions to get ideas for the cover art—four pages of questions, in fact. They ask about the overall setting of the book, the characters and what they look like, a short synopsis of the book, plus the author’s top three scenes that we’d like to see made into cover art. That doesn’t mean they’ll actually USE those ideas, but the gist of all the work is to give the art department something to go off of. If I could change one thing in the experience, I would love to go along at the photo shoot and watch. I trust the art department—they have a lot of experience and usually are great about getting what the reader wants to see, but I’d love to see the cover taking shape as it happens. If it isn’t an author I’m familiar with, I definitely look at covers first. Bethany House books usually have fabulous covers (especially my crit partner Regina Jenning’s February book SIXTY ACRES AND A BRIDE). I love cowboys, so if they are on a cover then I’ll usually pick it up. But… before I buy the book I usually peek at the ending. I’m one of those people that has to have a happy ending in my reading so I read the end first. I also read movie spoilers before I spend money to go see a movie! Lacy's question for you: I have always been a dog lover (we have three right now!) and love to read books with animals in them. Childhood favorites included “A DOG CALLED KITTY” (Bill Wallace) and “BIG RED” and “STORMY” by JIM KJELGAARD. I try to include animals/pets in my books when I can. In fact, the dog Wrong Tree in MARRYING MISS MARSHAL is loosely based off of a childhood dog that belonged to my sister-in-law. My question is: do you like animals as secondary characters in books? Do you have a favorite fictional animal? Filling the shoes of her late husband as town marshal hasn't been easy for Danna Carpenter. She's not only fighting criminals, she's also fighting to earn the respect of the townspeople. So crossing paths with tenderfoot detective Chas O'Grady is the last thing she needs. He's hunting a band of cattle rustlers and isn't used to the rugged Wyoming landscape. Teaming up is their only option, but when circumstances place them in a compromising situation, the town forces a more permanent partnership—marriage. If they can let down their guards with each other they might find that love is the greatest catch of all. Thanks for coming today, Erica and Lacy. Erica, I buy books, I really do, despite getting a few a month to review in various formats. I buy books that sound interesting to me by the plot described in any genre I read, and I'm pretty eclectic, sometimes by the price and upon recommendation of someone I trust. Lacy, I'm not really much of a pet person, but I grew up with cats, and recently my younger son and dil got a kitty (our grand kitty). I like cats and often find a way to feature them in my books too. My mystery series has some great cats that are characters in the stories, but subtly. Mostly. Although Carranza got his own interview once and thinks he's something. Thanks for hosting us, Lisa. I've met Erica at a couple of the ACFW conferences and she is a sweetie, and I need to go buy her book because it looks fabulous and I've loved he Heartsongs. She has a great voice. It'll be busy around here once the kiddos get up but I'll do my best to stop by and chat. 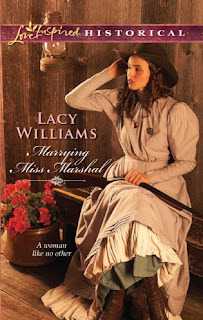 I was honored to read Marrying Miss Marshal prior to its release, and it was so much fun! Lacy, I was all about the horses when I was a youngster. The Black Stallion, Misty of Chincoteague, Black Beauty. I loved them all. First the author, then the story content. There are certain authors I always check, but the content has to be of interest to me. Hi, Linda! I've got a new kindle, and I'm finding it interesting to shop for books electronically. I'm with you on checking authors. I immediately went to search out favorite authors to see if they had something new. Erica, Barbour sounds like a wonderful place to be. It's great that they gave you so much input! Love the camera. We found one like that in a flea market in England. Paid ten pounds for it. They have antiques out the wazoo over ther. LOL. I adore vintage cameras, so you book sounds super cool to me. Lacy,your cover breeds a dozen questions! Love the rifle over crossed legs. What a contrast! Sounds fascinating. Love Inspired did an amazing job of capturing your story. I absolutely love the cover of Marrying Miss Marshall! Danna looks tough and vulnerable. They did a great job getting her character in that picture. Animals and children (and yes, there is a difference) can be very helpful in a scene. It's really fun to see how our heroes and heroines interact with them. Besides, an accurate historical setting would probably include a lot more animals and children than we are used to seeing today.